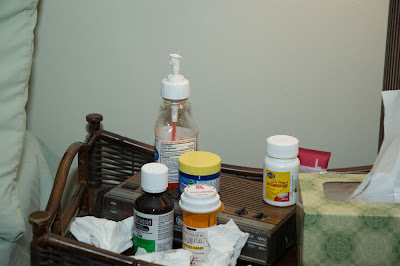 It started with a trip to my doctor for a urinary tract infection. Whatever happened to those little doors, between the restroom and lab, where you could just leave your ‘sample’ instead of having to walk down a long hall past a gazillion people carrying your cup of pee? …and counting ceiling tiles does not help one’s blood pressure. Never mind, I’m getting off tract track, back to my story. Now this infection could have been a hindrance to my weekend, but no. I’d like to think I look at the bright side of things. 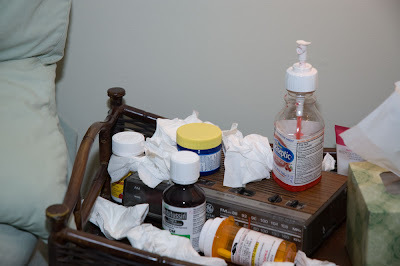 It meant that I could blame said infection for all the trips I’d be making to the bathroom as opposed to admitting it was the quantity of beer I’d consumed. Let’s move on. As I leave work I have the chills and my head feels as though it’s in a fog. I skip the grocery store and decide to go directly home. I have a bowl of soup and go to bed at 7:00 pm. Yeah, sometimes the best laid plans just get skewed. Thoughts of making your hair and feet purdy turn into a scrunchy and fuzzy socks; planned menus of beer and junk food become tea and soup; and intentions to blog turn out to be a weekend in bed with the television…unfortunately I now need to figure out how I’m going to pay my next cable bill with all the pay-per-view movies I purchased. 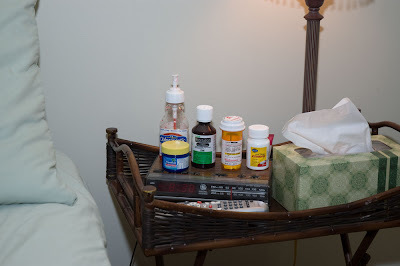 And the person who shared their sniffling, sneezing, coughing, aching, fever, not able to sleep illness? Guilty party, if you will? 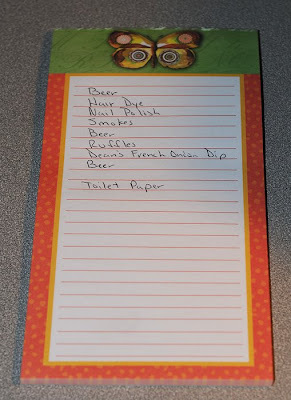 Your list of beer, ruffles and cigarettes made me laugh out loud. Sorry you were sick. Hope you are feeling better! What a funny post! I hate when you have to carry a cup of pee down the hall. Really?! I mean, isn't there some sort of dignity they would like me to have here? Hopefully you are feeling better today! Ick to planned weekends turning into sucky weekends. Boo. But you survived to drink beer another day!! Well, the little germflinger is sooooo cute!! Not the best way to spend a weekend, and I hope you feel better today. Oh, the cable bill? My husband freaks when we order a bunch of movies. Sometimes, it just can't be helped. What a great grocery list! ;) Feel better! Your granddaughter is the cutest! Well, at least you had some company. That grandbaby looks worth the sickness later - absolutely adorable! Your shopping list is one after my own heart. Ruffles, beer, and french onion dip! Is there anything better? Oh and please tell me you were going to dye your hair before you started drinking. My best friend is a hair stylist and you would not believe the stories she has about fixing peoples hair when they have been styling under the influence. Sounds like my kind of list, L. Gotta have chips and dip. Speaking of visits from the young people, my son is back from the university this week. It's their spring break so here he is enjoy a high of 79 degreesF here in Oklahoma today instead of the snow in upstate New York. He brought back a little "gift" too, so I am off work today getting over the sniffles and sore throat. Yup,those grandkids will gleefully deposit all sorts of germs in your home. Nice. But as someone else said, you lived to drink, munch and dye another day! Hope you're feeling better now. A family share shares germs together, stays together. Sometimes it's better to have a weekend in bed than to have it drag out all week - hopefully you are doing better! I also wonder why they do the urine walk of shame. My doctors office actually gives you a paper bag and you write your name ON THE BAG and then put your cup in your little lunch bag and THEN walk down the hall and give it to the nurse - who isn't always waiting, so you sometimes end up standing in the hall with a doggy bag. Not cool. Good. that means there's more beer for me.